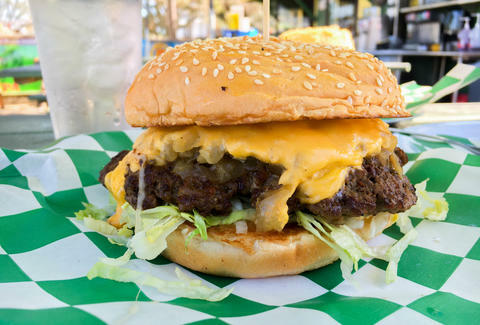 Editor’s Note: This story is the first entry in Thrillist's Burger Quest, Kevin Alexander's yearlong mission to find America's best cheeseburger. Read more about said Quest here, follow @ThrillistBurgerQuest, and use #ThrillistBurgerQuest to let Kevin know places he needs to hit. I figured the quest should start where I was born. In an effort to find the best cheeseburger in the country, I’m traveling to cities all over America and spending 48 hours trying as many vaunted burgers as I can. Thanks to its fantastic food reputation (and a selfish desire to see the house I lived in for the first six months of my life), I began my journey in Houston. The first thing you see on Christian’s Tailgate’s website is a stamp proclaiming them to have been voted Best Burgers in Houston. 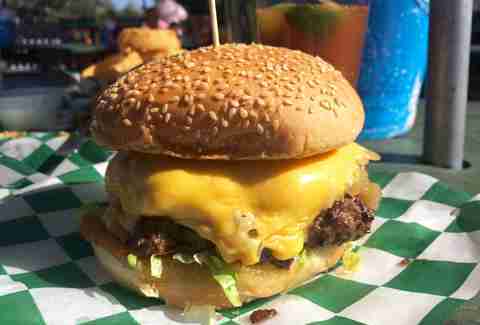 The main image on the site, in fact, is a giant burger image. And so I was excited to check out this mini-chain of local sports bars. Unfortunately, by the time I left, I was not that excited. I ordered the small (⅓lb) cheeseburger with American, and asked for grilled onions. When it came out, the first thing I noticed was the bun barely had any toast to it, and that most of the American cheese had slid off the patty into the bottom bun. The grilled onions were cut too thickly, and hadn’t been given time to properly caramelize, and the iceberg lettuce leaves were not shredded, so they, too, slid off with certain bites. The patty itself was medium thickness, and slightly overcooked for medium, but perfectly fine. It is certainly possible that I just happened upon an off-night for the kitchen, but either way, it sits in the bottom spot. I like Lowbrow. When I went, it was later in the night, around 10pm, but it was warm and the patio was crowded with people using swear words to hilarious effect. As per my rules, I got the Old School, which comes with “TX ground beef, cheddar, butter lettuce, pickles, tomato, red onion, challah.” There was a lot to like about the Lowbrow burger -- the aioli tasted like a delicious spicy Thousand Island; good acidity from the pickles; the bun, which seemed almost more pretzel than challah, was high-quality, with a good toast that stood up to the beef -- but the main issue keeping it from jumping higher was the actual thick patty. 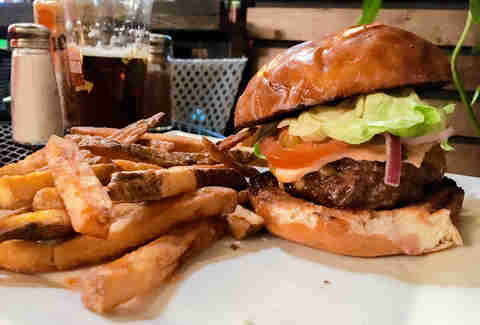 In my opinion, if you’re going to opt for a thicker burger style, you almost need to use an aged beef in order to give it the proper funk to keep it from just tasting like a lot of meat. The Lowbrow beef was salty and tasty, but didn't do anything to stand out beyond that. I do, however, highly recommend getting the queso and dipping your fries in it. 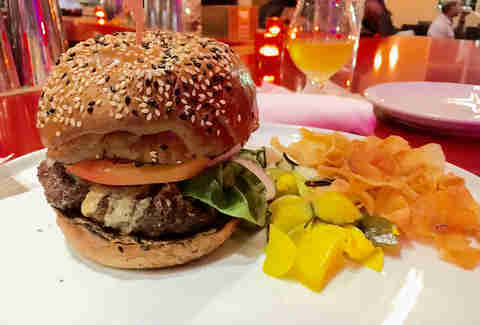 By now, I’m used to taking hotel restaurants seriously, as many are teaming up with top chefs, but I still felt a little bit strange rolling into the mostly empty restaurant in a JW Marriott at 3pm to silently eat a burger while the New England Revolution soccer team passed me in the lobby. 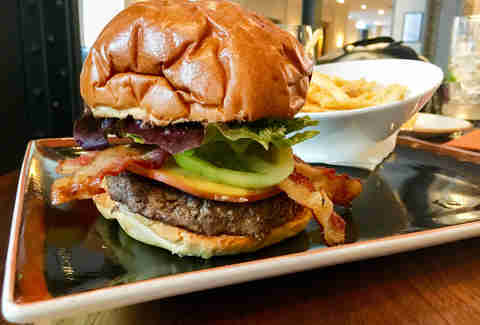 On paper, Main Kitchen’s BLT burger is my purist’s anti-burger -- for one, it has an avocado aioli and smoked gouda; for two, it also muddies the waters with bacon; and three, it has pickled green tomatoes, and I’ve made it clear how I feel about any sort of tomatoes. And yet, I begrudgingly carried on, and have to say that it was most unexpectedly tasty. There is a hint of apple when you bite in from the bacon. The buttered and grilled brioche bun, though puffy, squishes down in an agreeable way and doesn’t get soggy. 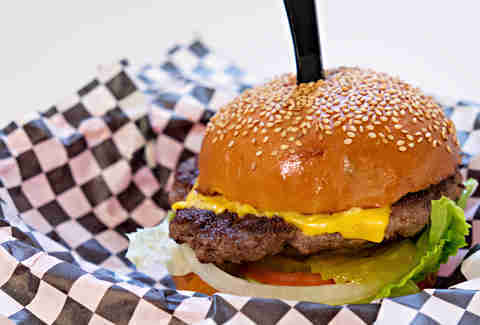 The 80/20 patty is mid-sized, but has a good peppery flavor. And -- I’ll be damned -- the pickled green tomatoes add a really refreshing vinegar cut. The bartender at W + M was grand. When I ordered the delicious gin + house tonic, we started talking about gins, and five minutes later he was letting me taste a crazy delicious, expensive German one, and this should serve as a reminder why sitting at restaurant bars is the best. Said bartender (I really can’t remember his name. Rodney? Lester? CHAD?) mentioned that the same woman makes the patties for the burger here every day, and she knows what she’s doing, because -- despite the fact that the patty was thick -- the meat was incredible, buttery, peppery, and juicy. There were some issues though -- the puffy seeded bun, though delicious, began flaking off all over the place, and the bottom got extremely soggy, and I couldn’t detect any aioli or other condiment to augment the flavors. Pro tip though: it comes with a mess of pickled veggies and peppercorns. Put them on your burger. Oh, and see if Chad (?!?) will give you some of that German gin. The place is tilted. As in, the floor has a somewhat dramatic slope, and you can see people sitting at tables on said slope actively tilting their bodies to compensate. It is also legendary, for good reason. The burgers are giants, and very good. The soft sesame bun somehow still manages to hold up to the thin, yet terrifyingly substantial, patty, thanks to some savvy griddling, and the mustard/mayo combo has enough acid and fat to balance out the veggies. I also watched a man eat the patty melt, and almost broke all of my own rules, gave up, and ordered one of those for myself, too. One of those places you just know you’ll kind of love, Hay Merchant is a place I've been excited to try ever since we named it to our 33 Best list a few years back (Editor’s Note: my co-writer, who is based in New Orleans, recommended the burger, as I’d never tried it). And while it does have so many things going for it -- great, melty, oozey American cheese; a perfect bun for the build that never got soggy; classic pickles; and two fantastic, juicy, beefy patties -- there were a few things I’d alter: for one, the patties are slightly too thick for a true thin, classic double burger, and while the beef and the cheese blend well, it could benefit from some grilled onions and aioli to bring out more of the complex beef flavors. Either way though, it’s a solid choice. Stanton’s is a Houston classic. Opened in the '60s originally as a grocery store, it still has that look and feel, especially when you go to the counter and see the boxes of M&Ms and Blow Pops. My dad says he came here in the '70s and '80s when we lived in Houston, and the entire thing had a bit of a White Hut feel, so I got pretty damn excited. 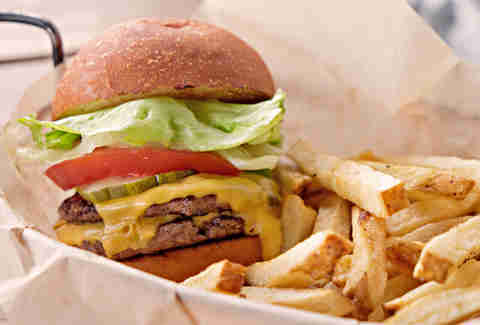 And for good reason, as this is a delicious burger. The loosely formed patty has that proper crusting I always look for in a griddle burger, and the sesame bun and onions were nicely griddled as well. Most of the accoutrement I could’ve honestly done without. The leaf lettuce got in the way of the overall flavor of some bites (and you ALREADY know how I feel about tomatoes), but the pickles and mayo/mustard combination did combine for a nice acidity with the beef and cheese, and the experience of eating at a burger shack my dad enjoyed when he rocked a legit 'fro made me feel like I was a good child. 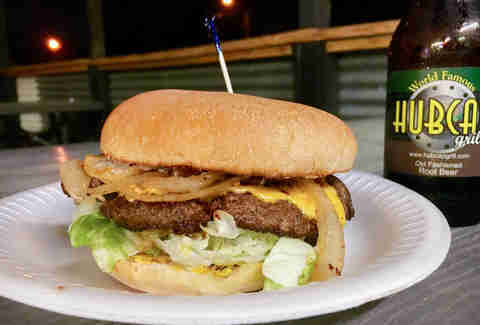 Hubcap Grill in Houston Heights was one of the last restaurants I visited. I was tired, and cranky, and slightly over my entire burger expedition. And then I ate their burger, and things were different. The bun, which looked to me like it was too thick and possibly stale, was actually perfectly sized, super-chewy, delicious, and had the best flavor of any bun on the trip. It almost tasted like Portuguese bread, with a hint of sweetness, and didn’t get soggy at all. The grilled onions were thickly cut, but caramelized nicely; the lettuce was shredded, and the ⅓lb patty was griddled with almost a soy, umami flavor. It was absolutely fantastic. Yes, I know that Tookies is actually about 30 miles outside of Houston in Seabrook, sitting down on the Gulf. But trust me, city-folk, it’s worth the drive. I sat out at the picnic tables amongst biker enthusiasts, and guys in Tommy Bahama with serious, alarming tans, under a giant live oak, and ate by far my favorite burger of the trip. 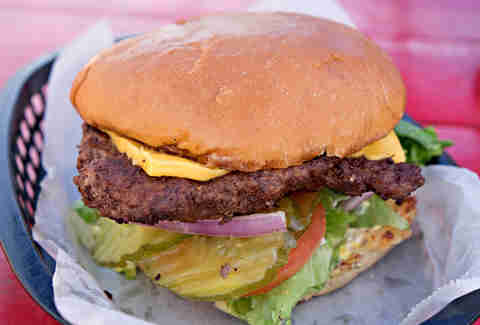 Tookie's entry featured a perfectly thin peppery patty smashed with just the right amount of crust and char, sitting on a bed of grilled onions that were buttery without being overly greasy, plus hamburger pickles, shredded lettuce, and mayonnaise. The sesame bun was relatively nondescript, but it didn’t soak through on the bottom, and I sat eating as Bruce Springsteen played over the speakers and became truly happy. 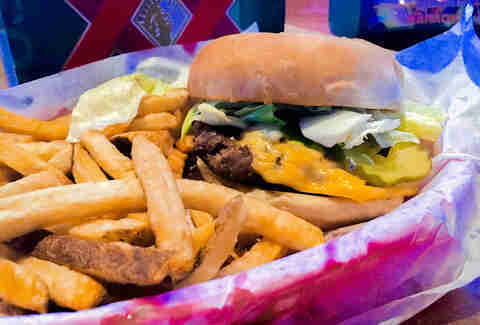 This is a burger worth traveling for, friends. Go there now. Kevin Alexander is Thrillist’s National Writer-at-Large. Follow his burger quest or yell at him about what he's doing to his body @KAlexander03.